Thomas Bolden grew up on the streets, his childhood a blur of fragmented memories. But now he’s managed to put his past behind him, find the woman he wants to share his life with, and carve out a successful career on Wall Street. Until, in the blink of an eye, his world is turned upside down. A bizarre kidnapping sends him fleeing for his life, his face everywhere on the TV news, and a violent, shadowy organization is framing him for crimes he did not commit. 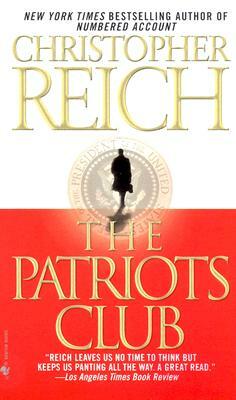 Furiously paced, filled with brilliantly drawn characters from politicians to patriots, from Wall Street players to battle-hardened cops, The Patriots Club is vintage Reich: brilliant, breathtaking, and impossible to put down until the final unforgettable page is turned. Christopher Reich was born in Tokyo in 1961. A graduate of Georgetown University and the University of Texas at Austin, he worked in Switzerland before returning to the United States to pursue a career as a novelist. The bestselling author of four other acclaimed novels, Numbered Account, The Runner, The First Billion, and The Devil’s Banker, he lives in California with his wife and children.